While shopping and looking to spruce up my fingernails with a fun new springy color, I came across Sally Hensen’s Salon Effects. Located in your drugstore aisle along with the nail polish and nail polish removers, this product is essentially appliqués that you can apply like stickers to your nails. They will last up to 10 days and you can get a variety of fun patterns. I was intrigued at the idea of the “Skinny Jeans” after I got chatting with a couple of friends and they all seemed to think it would be a ton of fun to have denim on their fingernails. I wasn’t so sure – these are just stickers and don’t have the denim pattern or feel to them. But I also wonder if you can tell if they are true denim or not. What do you think? Jeans for your fingernails? Of course “Skinny Jeans,” as these strips are called, aren’t the only patterns available. As you can see there are many options available. The “Bling It On” pattern (pink Glittery) is pretty fun and I can see applying these for a fun evening out with the girls. I like the idea of using a nail sticker because it won’t peel and there’s no drying time! Plus if it truly lasts the 10 days it claims, that’s a lot longer than a manicure lasts on my fingernails as it’s tough to keep pretty looking nails when you’re taking care of kids and house all day. 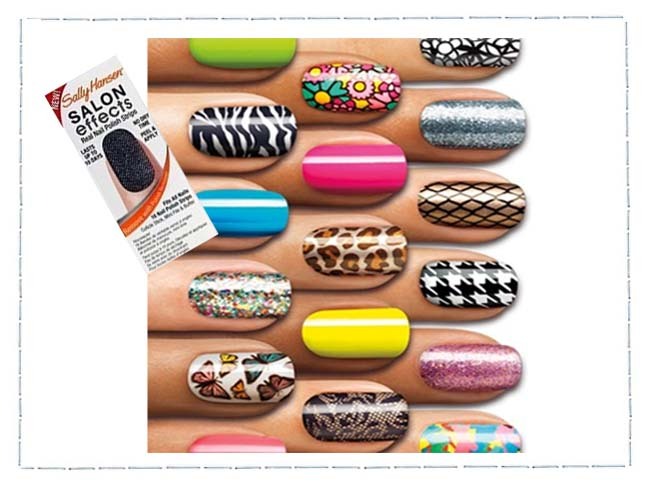 Get Sally Hensen’s Salon Effects Real Nail Polish Strips at your local drugstore. You can also find them on Amazon.